Recession of gingival tissue can cause the appearance of dark, triangular spaces between the teeth at the gumline. 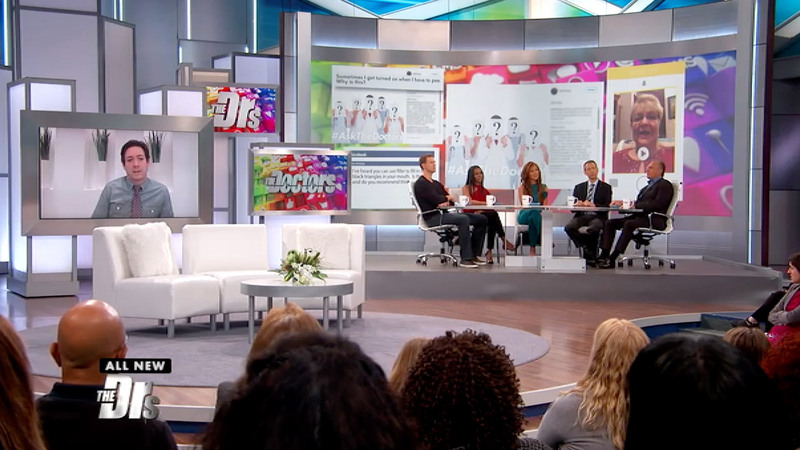 Recently on The Doctors, one viewer submitted a question about whether injections of cosmetic dermal filler into the gum tissue can be an effective solution for closing these kinds of gaps. Thankfully, Las Vegas cosmetic dentist Joe Willardsen, DDS was available to provide his expert opinion on this type of treatment. Dr. Joe explains that gingival recession can have many causes, such as periodontal disease or simply aging of the tissue. The dark spaces that form between the teeth are the result of the gum tissue retreating downward from the tooth body, often along with the bone. He goes on to say that with careful injections of a small amount of dermal filler, it is possible to volumize depleted areas of the gums. The injections lift the tissue to conceal gaps and create a more perfect smile. While this treatment can deliver satisfying results for some patients, Dr. Joe reminds The Doctors that the effect created by the dermal filler may last only four to eight months before more injections are required. Typically, this treatment costs patients around $100 per injection site. He also emphasizes the importance of clearing up any signs of active gum disease or other oral health concerns prior to receiving dermal filler injections in the gumline. For patients with severe recession that exposes the tooth root, Pinhole Gum Rejuvenation® treatment may be a more effective and longer-lasting solution. If you’d like to learn more about Dr. Joe and want find out which dental treatments could enhance the health and beauty of your smile, please contact True Dentistry to schedule a consultation. Home > Would You Try Dermal Fillers to Treat Gum Recession?